Sri Lanka’s first woman recipient of the “Deshamanya” award and former Health Minister Ms. Siva Obeyesekere passed away peacefully in Colombo on Saturday December 23rd 2017. The Former parliamentarian for Mirigama known popularly as Siva was 88 years of age. Sivagamie Verina Dassanaike who was born on May 7th 1929 studied at Ladies College Colombo. She married former Attanagalle MP, Senator and Deputy Finance Minister “Deshamanya” James Peter Obeyesekere in 1948. Both JP and Siva Obeyesekere were founder members of the Sri Lanka Freedom Party(SLFP) in 1952. JP Obeyesekere who served as Attanagalle MP and deputy minister passed away in October 2007. Siva Obeyesekere was first elected to Parliament from the SLFP as MP for the Mirigama constituency in 1965. She was re-elected in 1970 and was appointed Deputy minister for health in the United Front Govt of Prime minister Sirima Bandaranaike. After the death of George Rajapaksa in June 1976, Siva Obeyesekere became Miister of Health. 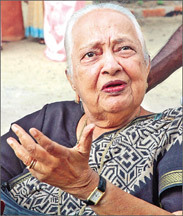 She did not contest Mirigama in 1977 when the UNP Juggernaut led by JR Jayawardene swept the polls. Her husband JP Obeyesekera contested Mirigama and lost. She bade adieu to active politics after that and focused on uplifting the Handicaft and handloom sector. As Health deputy minister and minister Siva Obeyesekere organized and established the National Family Health programme which was recognized by the United Nations as a model for the world – both developing and developed.She also ntroduced the Thriposha Food Supplement Nutrient in association with Dr. Brighty de Mel. Another of her vocations was in treating and preventing cancer. She was President of the Cancer Society and established many branches in the outstations. Siva Obeyesekere was the first woman to receive the prestigious “Deshamanya” award which was bestowed upon her in 1991 mainly for her positive dedication and service to promoting traditional handicrafts . She was passionately devoted to cottage industries,handlooms and handicrafts. She was instrumental in setting up the “Laksala” network of cottage industry emporiums. She also established the National Artisans and Craftsmens Association of Sri Lanka.In later life she founded “Lakpahana”.She was the Chairman of the National Craft Council and President of the World Craft Council. As a politician Ms. Siva Obeyesekere was incorruptible and without blemish. She was a simple, modest and gracious lady who earned the respect of her colleagues,subordinates and employees through her kindness and courteous conduct. She leaves behind a son Peter and daughter Chantal and their families.